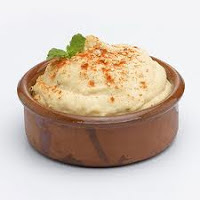 Puree chick peas in a food processor and add lemon juice. Continue pureeing and add cumin, garlic, tahini paste and salt. Next, add the olive oil until a soft, creamy consistency has been obtained. Remove to shallow dish, sprinkle paprika for garnish and serve with warm Pita bread.